We currently have a technical problem with the login of our news content management system. The software developer blames the hosting service while the latter blames the former. This is the link to the News Main Page for access to new reports up to June 27, 2015. Global Economy: The Bank for International Settlements (BIS), the oldest international financial organisation, which has a membership of 60 central banks, warned at the weekend that an unprecedented period of ultra-low interest rates mask severe weaknesses in the global economy, which risks leading to the next financial crisis. The BIS says such low rates are only the most obvious symptom of a broader malaise, despite the progress made since the crisis. "Global economic growth may now be not far from historical averages but it remains unbalanced. Debt burdens are still high, and often growing, relative to output and incomes. The economies hit by a balance sheet recession are still struggling to return to healthy expansion. In several others, financial imbalances show signs of building up, in the form of strong credit and asset price increases, despite the absence of inflationary pressures. Monetary policy has taken on far too much of the burden of boosting output. And in the meantime, productivity growth has continued to decline." "There is something deeply troubling when the unthinkable threatens to become routine," the BIS adds in its 85th Annual Report, released Sunday. In its main economic review of the year, the BIS calls for a shift to a longer-term focus in policymaking, with the aim of restoring sustainable and balanced growth. The report says the global economy has been growing not far away from historical average rates. Lower oil prices have provided a welcome boost, and dollar appreciation has shifted growth momentum from stronger to weaker economies. But the global expansion remains unbalanced, debt levels and financial risks are still too high, productivity growth is too low, and the room for manoeuvre in macroeconomic policy has continued to narrow. 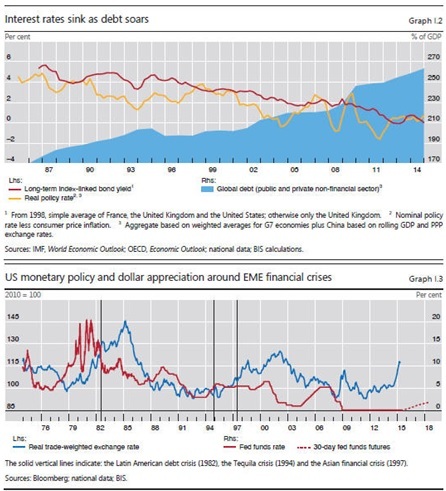 The most visible symptom of these tensions is that, globally, interest rates have been extraordinarily low for an exceptionally long time, against any benchmark. "In particular, the fall of sovereign bond yields into negative territory has been unprecedented and has stretched the boundaries of the unthinkable." Understanding the underlying causes of these tensions is proving exceedingly difficult. A key reason for these tensions, argue the BIS authors, has been a failure to come to grips with how financial developments interact with output and inflation in a globalised economy. For some time now, policies have proved ineffective in preventing the build-up and collapse of hugely damaging financial imbalances. These have left long-lasting scars in the economic tissue. The report also casts light on two underappreciated aspects of the problem. By misallocating resources, financial booms can sap productivity both as booms unfold and following the crisis they leave in their wake. And the international monetary and financial system has amplified financial imbalances by transmitting exceptionally easy monetary and financial conditions to countries that did not need them. The US Federal Reserve is expected to become the first central bank in the rich world to raise interest rates since 2008. Wall Street analysts expects the Fed to tighten monetary policy later this year, but at present the policy makers do not even know now if that will happen, while the Bank of England would be expected to follow in 2016. The European Central Bank and the Bank of Japan are currently involved in quantitative easing programs — bond-buying that is commonly termed money printing — to boost economic activity. The right response is hard to implement. The policy mix will be country- specific, but its general features are not. What is required is a triple rebalancing in national and international policy frameworks: away from illusory short-term macroeconomic fine-tuning towards medium- term strategies; away from overwhelming attention to near-term output and inflation towards a more systematic response to slower-moving financial cycles; and away from a narrow own-house-in-order doctrine to one that recognises the costly interplay of domestic-focused policies." They add that an essential element of this rebalancing is to rely less on demand management policies and more on structural ones, so as to abandon the debt-fuelled growth model that has acted as a political and social substitute for productivity-enhancing reforms. The dividend from the oil price drop provides an opportunity that should not be missed. Monetary policy has been overburdened for far too long. It must be part of the answer but cannot be the whole answer. Otherwise, the danger is that the previously unthinkable becomes accepted as the new normal.